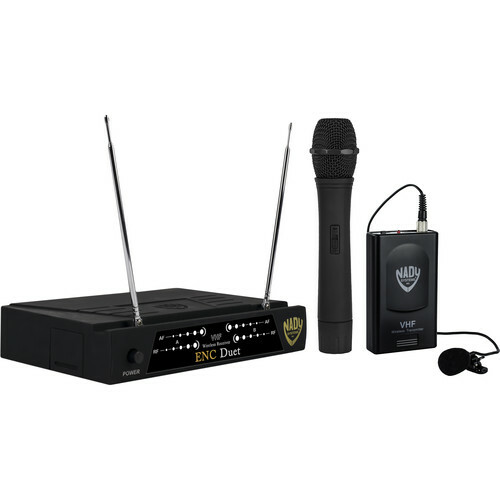 The Nady Encore Duet Dual Wireless Combo System is a cost effective cable-free solution for karaoke, DJs, houses-of-worship, auditoriums, presentations, conferences, small performances and more. The Nady Encore Duet Dual allows for individual or simultaneous wireless operation over two VHF frequencies. The system includes a rugged receiver with dual antennas, 1/4" phone and XLR outputs for connection to a PA system. Also included is the WHT handheld transmitter with DM-10D capsule, and WLT bodypack transmitter with LM-14O omnidirectional lavalier microphone. The transmitters operate up to 15 hours on single 9V batteries. Box Dimensions (LxWxH) 12.0 x 11.6 x 2.3"